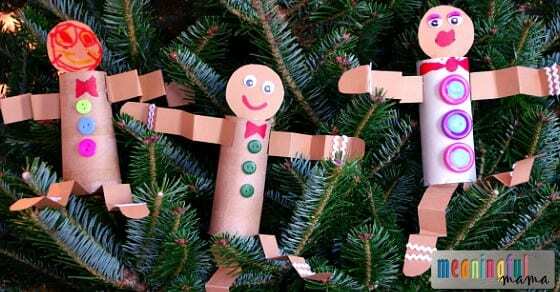 I want to fill your Christmas season with a variety of craft ideas. You may have seen my egg carton snowman craft, stained glass nativity, popsicle stick Christmas tree, or egg carton angel craft. 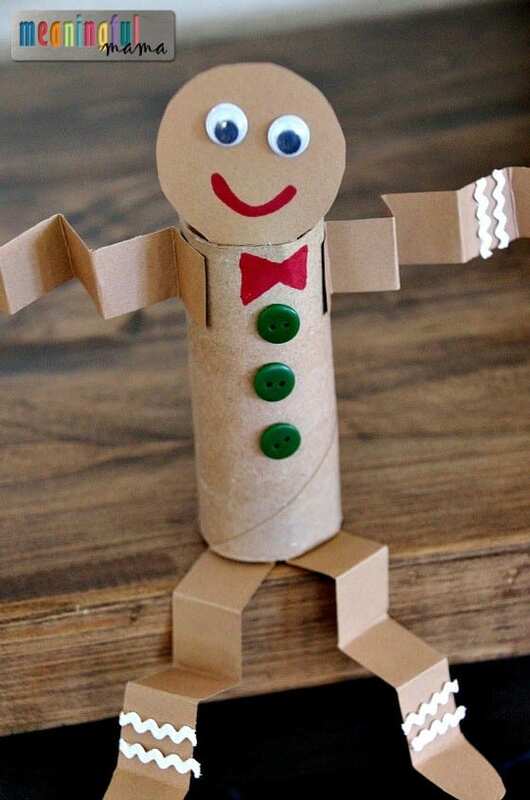 My toilet paper roll gingerbread man craft is yet another holiday craft idea using simple, inexpensive and recycled materials. All my kids enjoyed creating their own unique version of a gingerbread man. I love glue dots. They are definitely one of my favorite craft materials because they adhere quickly and yet are easy to use. If you don’t have craft dots, I think tape or double stick tape would be the best adhesive for attaching the head and limbs. 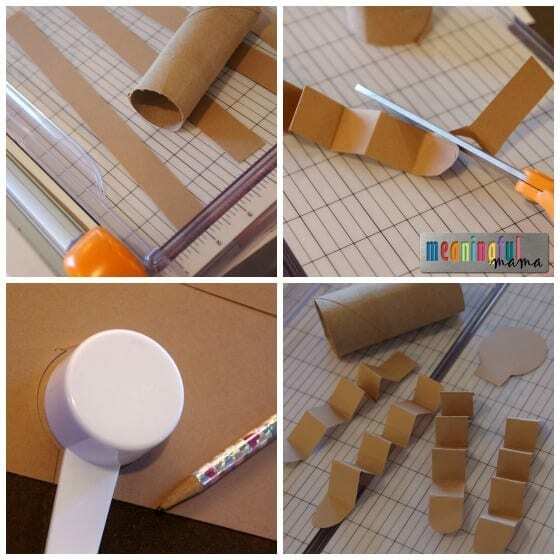 Cut 1/2″ – 3/4″ strips out of the brown construction paper. Do an accordion fold back and forth on all the limbs. Cut to the desired length for arms and legs. Cut a rounded end for the feet and hands. Trace around a measuring cup to create the head with a tab. 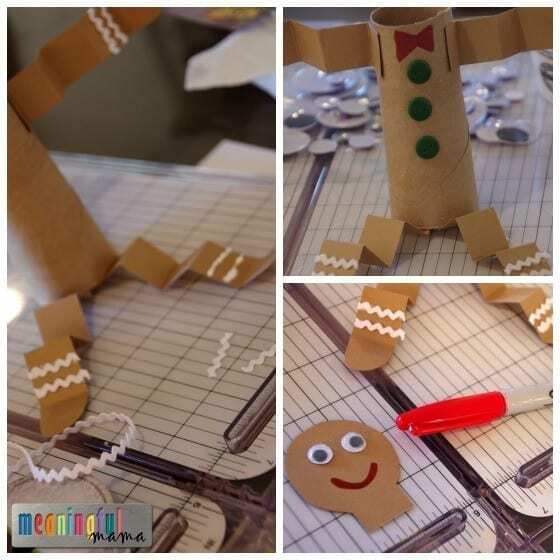 Using glue dots, tape or double stick tape, attach limbs to the toilet paper roll. Glue white ric-rac trim to the ends of the legs and hands of the gingerbread man. Using glue dots or glue, attach wiggle eyes to the face. Add a mouth using a marker. Using glue dots or craft glue, attach buttons. 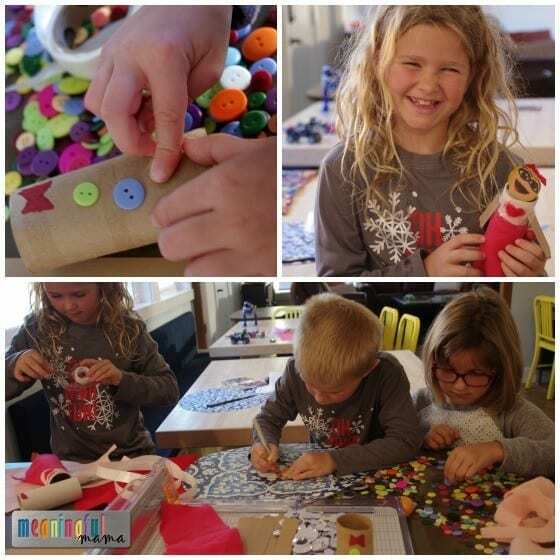 Attach head using glue dots or tape. You, of course, will want to encourage your kids to make the craft their own. You will have kids that want to make it look exactly like a traditional gingerbread man, and you will have kids that deviate from that idea (see my daughter’s in the upper left corner in the picture above). My kids were more apt to come up with their own ideas, which is great. Quite honestly, I always want it to look like an actual gingerbread man, so I have to embrace that the kids are using their own creativity and imagination. Can’t wait to try this with my daycare kids!